With that image in mind, below the cut is a collection of blurbs and links outlining why I will always have a spot in my heart for a group that was once described as “the five dreamiest white boys on Earth,” and ultimately why discussion around pop groups matters. Indeed, girl-consumers also use boy bands, among the most slickly produced and marketed youth/music industry products of recent memory, in intensely personal, individually empowering, and occasionally unsanctioned ways. This includes recasting the industry imperative to consume boy bands according to a straightforwardly heterosexual model of desire – a model materialized through the fashioning of different personas for each member of a boy band (one’s the shy one, one’s the prankster, one’s the romantic, one’s the rebel, and so on) – and instead using boy-band fan practices to mediate intimate relationships between and among girls. In short, boy bands aren’t taken seriously for a number of reasons, many of which are outlined in Wald’s essay (the reasons range from lack of “legitimate” historical “roots,” such as those found in rock n’ roll, to the association with teenage girls mentioned by Sabi above). However, these groups (and the fannish activities centered around them) can have a huge impact on a fangirl’s life, and while I feel there are definite negatives that come with boy band fangirling (which could probably lend itself to another monster of a blog post), most people do not witness enough attention focused on the positives. In my case, I often cite *NSYNC as one of the reasons as to why I have the singing voice that I have (which isn’t the best but isn’t exactly the worst, either). It isn’t uncommon to hear me say, “Everything I know about singing, I learned from 90s pop.” Additionally, this particular boy band has the vocal ability, stage presence, and narrative that continue to appeal to me to this day. And yeah, they were initially marketed as the non-threatening pretty boys who could sing and dance, so… as a human being, that’s difficult to resist. Oh, and it also helps that I, like many others, tend to crave nostalgia in times of uncertainty – and if there’s anything to be said about post-undergrad life, it’s that it’s uncertain. Truthfully, if you wanted to get a solid overview as to why I love *NSYNC, most of it would be covered after you watch their VH1 Driven special. Thanks to the power of the internet, you can view that one-hour special by clicking this link. You’re welcome. The special itself gives insight into each of the members (yes, including Chris and Joey! ), their vocal experience, how the group was formed, and the messy Lou Pearlman drama that erupted before the release of No Strings Attached (not mentioned, however, are the allegations that Pearlman was a sexual predator). The special also uses a lot of *NSYNC songs, so what’s not to love? For those of you who don’t have an hour to spare, here’s a quick summary of *NSYNC’s story: it isn’t as polished as they would like us to believe. Joey’s father summed it up best in the special when he says, “This is a dirty business.” In spite of all of that, they worked hard, tightened their harmonies, danced their butts off, and gained international superstardom. They were [marketed as] non-threatening boys who could carry a tune! Basically, if you’re rooting against them, there’s a good chance that you need to take a step back and think about your life choices. The videos speak for themselves, really. They could deliver live. It’s no wonder they were able to work with artists such as Michael Jackson, Phil Collins, Gloria Estefan, Celine Dion, Richard Marx, and uh, Tim McGraw. They’ve also done work in supergroups (Super Bowl XXXV or “What’s Going On,” anyone?). Additionally, *NSYNC and its individual members have done work with Blaque, TLC, and Nelly, which worked to further cement them as culturally relevant during that era of pop music. Nowadays, *NSYNC is most often mentioned when it comes to record sales. To this day, the group continues to hold the record (for the SoundScan era) for the largest one-week sales: 2.4 million albums sold in one week for No Strings Attached. In today’s digital era, that record is a tough one to crack, and it is a number that many *NSYNC fans hold dearly (though it is true that the Backstreet Boys sold more records as a whole worldwide… we’re talking instant gratification, people – the one-week record is an excellent example of extreme fanaticism! see also: this entire blog post you are currently reading). If we’re talking about fanaticism (and we have been, unless you just magically happened upon this monster of a post on a whim), it’s always a good thing to note who your “favorite” is – especially when we’re talking about *NSYNC. Now, we could talk for days about why we can’t play favorites with human beings, but it’s important to look at boy bands as what record labels look at them as: tools that can make serious bank. With multiple members in a boy band, consumers are bound to find at least one member that appeals to them. This is because boy bands tend to fulfill certain archetypes. A good reference point is V. Arrow’s Boy Band Trope/Archetype Equivalency Chart on her personal tumblr. He once saved a baby’s life while vacationing in Miami. Seriously. In addition, he’s also good-looking, sometimes says funny things, and has a nice backstory (in case you forgot: watch his section in the Driven special). So yeah, I have extremely legit reasons for liking this dude, and it is because of this Highest Legitimacy that I will continue to fangirl over him until the end of time, along with the rest of the guys in *NSYNC. 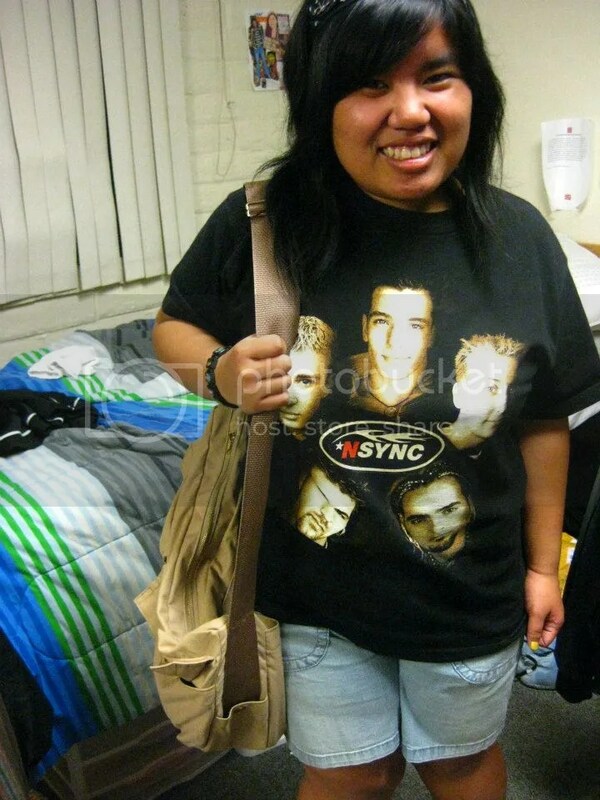 Really though, I have some mad love for every member of *NSYNC. My feelings on Justin Timberlake probably warrant a separate private conversation, but *NSYNC as a whole! I love them! I don’t know if you caught this in my last section, but their harmonies are kinda awesome, I think! *NSYNC and other teen idol-type figures are important parts of the tweenage years because they play a vital role in identity formation. As much as we would like to talk about going on a soul-searching journey in middle school, it’s important to note that most of us were socializing around pop culture. With a group like *NSYNC, fans like myself felt a connection to the group, to individual members, to the performances, and to other fans. Boy bands and other pop groups are forces to watch not just because of how lucrative they are, but also because of how much power they hold in shaping the lives of audiences around the world.